This week has been significant in a good way. It has been one to write on the calendar – worthy of remembering. After 9 excruciating years, my husband has a shed. It may seem nothing to many but to us it is the final piece of a puzzle to starting a fresh. Putting a line under the crap that has gone before and a long with ‘The Pledge‘ put down roots and a routine to ground us on low spoon and emotional times. My husband has always had access to a shed or workshop, to tinker, mend or create. It was his place to go to clear his thoughts, release emotions and relax. He is naturally creative and this was his outlet. Suddenly in one house move it was gone. Promises to have a replacement were broken and delayed. Mainly because of finances. 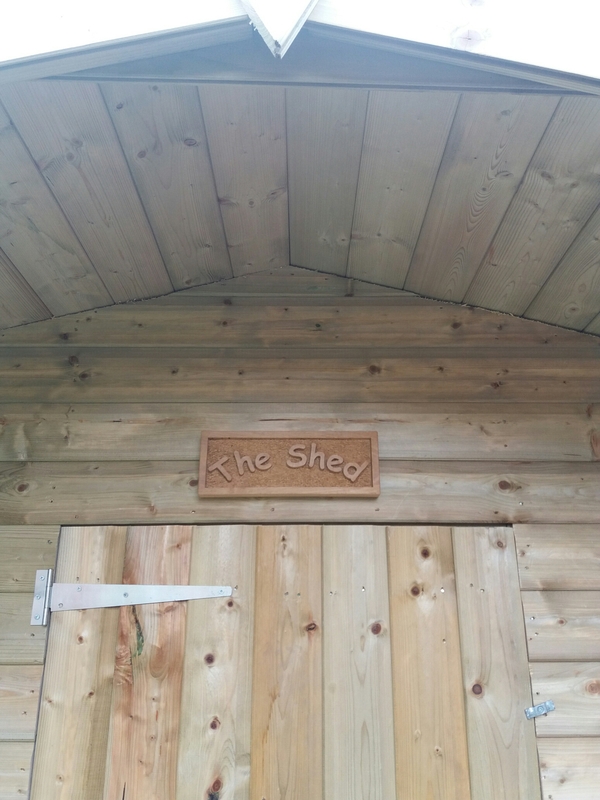 Since he became my full-time carer it has been evident he needed a shed more than ever. Somewhere he could go to relax and to be himself rather than a husband or carer. He had tried other ways to have him time but there has always been a big issue in his mind the guilt of being a way from me and worry of what he will come home too. This means the hobby is counterproductive. Not sure why he doesn’t trust me to be alone (looking at the bruise collection on my legs and recalling the burnt saucepan from my attempts at booking eggs). Chronic illness not only robs the sufferer/fighter of themselves and the lives they expected but does the same to those close around them. It is nasty like that. We are hoping the shed will give some of him back. Just need to work out how to afford to do the work bench and other bits he needs to do stuff in there. But for now he can drink tea/beer in there and dream of his perfect space. Already it has given him a much-needed boost and hope for the future. For years, as for many Spoonies and people with chronic conditions, a good night night sleep has been elusive. I count myself lucky if I have 4 hours straight. I struggle to get to sleep despite my body screaming for it all day and my eyes quite happily dozing on the sofa half an hour before. When I do drift off it is only a couple of hours before my brain cell wakes up whirling with ideas and thoughts. I can have brain fog all day but at 3 in the morning, it can remember all the things it has forgot to do, which need to be added to the neverending to-do list as well as planning all the things I could do. It has the knack of forgetting the body it is controlling (or attempting to) as it brims with enthusiasm for finishing degree and training to be something. It is indoctrinated with the philosophy of Mind over Matter so it thinks it can change the world. This idea is immediately shelved by the time by the time I am up and dressed. My brain cell retreats back into it’s fog like state for the rest of the day. Now as I am lying here with a snoozing dog and snoring husband next to me , I want to experience that again. I may not be turning into a pretzel as much but I miss that pleasure of a good night’s sleep and the wide awake feeling when everyone else can see it. Still wobbly but back to blogging for Dystonia Awareness! Crashing down with a bump!